This entry was posted on November 24, 2016 at 12:22 am and is filed under Adventure, Animation, Comedy with tags 2016. You can follow any responses to this entry through the RSS 2.0 feed. You can leave a response, or trackback from your own site. Oh my gosh! You are so right about this film! I will always defend the princesses of old as being a little better than they are often brushed aside as but Moana is such a nice person! I completely agree with you. Just this whole movie felt positive and left me feeling so happy. I loved pretty much everything about it. And I’m so excited for little girls to add Moana to their Disney princess fandom. You are right about her looking more athletic and normal and as a fellow curly haired girl I loved she had curly hair (a first of the princesses aside from Merida). My only defense of Merida is she didn’t know she was changing her Mother into a bear. She was just told she would be changing her fate. But anyway Moana is a million times better than Merida! I loved the music and the colors and the comedy. That chicken was hilarious. I can’t wait to see it again! Your point about Merida is technically correct, but her motives were not good. I found her a very selfish person and possibly my least favorite lead character in an animated film ever. Moana is wonderful, as an individual and as a whole film. The more I think about this movie, the more I love it. It harks back to The Little Mermaid for me. That’s always been an example of the film where Disney got everything right. It re-invigorated the studio into a new era. The Little Mermaid soundtrack was was one the very best they had ever done. I think, song for song, this is the best collection of songs since that film. There are several that I find myself singing as opposed to just one. Yes I will be seeing this again! You are speaking my language with Little Mermaid praise! It’s one of my favorite movies! I also agree more I think about Moana more I love it. “The evocation of paradise is stunningly beautiful.” — this is what I was first attracted to about this, and quite frankly the only thing really. Okay, other than Dwayne Johnson. Dude can do no wrong. But this movie sounds like it has quite a bit more going on. I’m sold! The Rock is so good. Dear Hollywood, please put Jemaine Clement and The Rock in another musical together. Ha ha. I was predicting $300 million but it doesn’t appear that it will. Still a huge hit, yes, but when Universal’s The Secret Life of Pets made almost $370 million, the possibilities were raised for this Disney film – a great one at that. I agree about Moana being very much in Disney’s wheelhouse and about it sticking to their successful archetypes. You’re also right that Moana shows more humility than other recent Disney heroines. I found her to be refreshingly different too. I liked that her dad’s reason for keeping her wasn’t just the standard trying to keep her safe or stuck in her gender role. He tried leaving the island too and lost his best friend in the process, which I think is a pretty darn good reason for wanting her to stay on their island. I loved Maui was a character for his design, for his expressive face (like you mention), and his interactive tattoos. I also dug the silly rooster and how the ocean itself became a sassy character. Unlike you, I wasn’t a big a fan of the music. 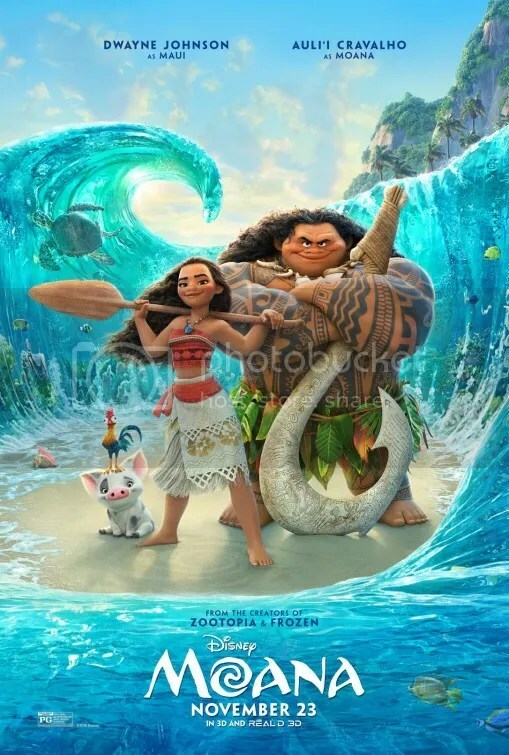 Some of the songs were really catchy like “How Far I’ll Go” and “You’re Welcome,” while others I thought were total misses like “Shiny.” Overall, I found Moana delightful and wished it got more attention last year. Not a fan of the music eh? I thought Moana‘s soundtrack was one of Disney’s best in a long time, maybe since The Little Mermaid.